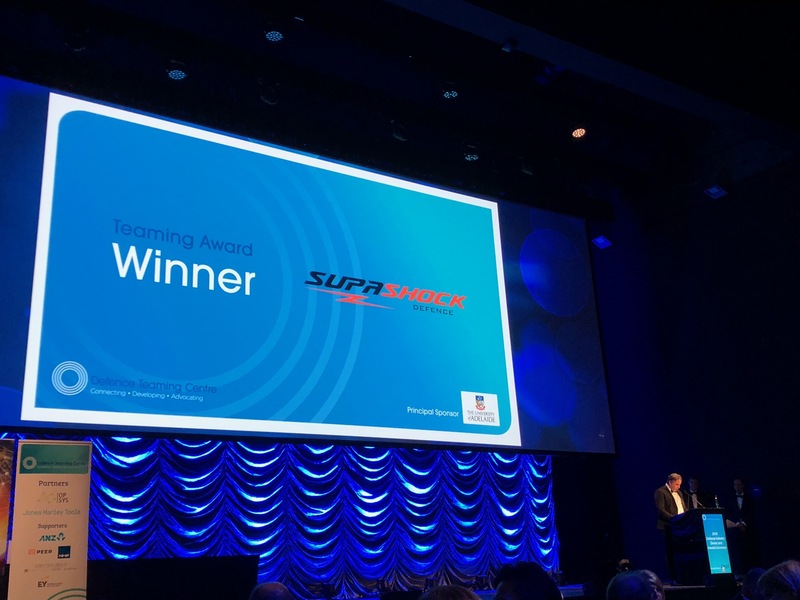 Adelaide-based motion technology company Supashock has received a major award from a peak industry body for the development of its revolutionary Advanced Load Handling System technology. The company received the Defence Teaming Centre’s (DTC) award for “Outstanding Collaboration” for the development of the ALHS 17 technology for heavy logistics trucks alongside South Australian manufacturer Century Engineering and major defence prime Rheinmetall Defence. Developed specifically for military vehicles, the ALHS 17 technology reduces the risk to soldiers by automating the loading and unloading of ISO containers, modules and STANAG compliant flat racks of up to 17 tonnes from within a highly protected truck cabin. In addition to improving safety, the technology also significantly reduces the time for distribution of military supplies in demanding battlefield environments – the loading cycle time is only 25% of existing systems. Supashock Managing Director Oscar Fiorinotto congratulated his team of engineers for their skill in developing the ALHS 17 technology. “The ALHS17 concept came about to provide defence forces with greater operational flexibility, efficiency and sustainment by providing a completely protected environment, and the ability to load and unload a container in varied terrain,” Mr Fiorinotto said. He also commended Century employees for their contribution in rolling out the ALHS 17 product. “Century Engineering provided specialist fabrication and manufacturing services for the development of ALHS 17 and, from a collaboration perspective, they opened up their business and worked with our team to provide support in the areas where it was required,” he said. Last but not least, Mr Fiorinotto thanked the DTC for its recognition of Supashock’s collaborative efforts. “Our entire team would like to acknowledge the DTC not just for this award, but for providing valuable advocacy for South Australian businesses operating in the defence industry,” he said. “I’d also like to offer a special thankyou to the team at Rheinmetall, and especially Ben Hudson and Michael Wittlinger, for their efforts in the birth of this special system, along with Century Engineering for their fabrication work.